phew I am just about catching up with normal life after more than three weeks away from home. I always enjoy travelling, and feel inspired by lots of interesting things I see on my travels. One of the things I will very often notice, is an interesting DOOR! So, I am not surprised then, that when I just came across this stunning photo (whilst browsing Pinterest) , it spoke to me - in fact it shouted out "Hi, look at me, aren't I just beautiful?!". 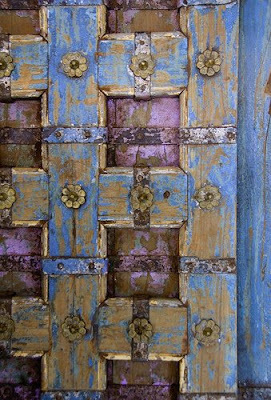 The colours on this old door are just stunning together, don't you think? It inspired me to find a few more beautiful aged doors, with their weathered-paint colour combinations, to share with you. I think they all just soooo gorgeous! I adore the fact that colour inspiration, and indeed design inspiration in general, can be found pretty much anywhere, even from something as simple as a door! If you love doors too check out my Pinterest board dedicated to them here. You have just reminded me to blog all the pictures of doors I took in NYC and Paris. Wonderful images. Monday Marvellous - Majestic Moths! Travel Picks..... Singapore inspired Etsy finds.